Even as Liberman criticized policy on Khan al Ahmar, Defense Ministry began negotiations on legalization of another illegal outpost nearby. According to Prime Minister Binyamin Netanyahu, "in the very near future" the State of Israel will enforce the Supreme Court's ruling and evacuate the illegal Bedouin outpost known as Khan al Ahmar. 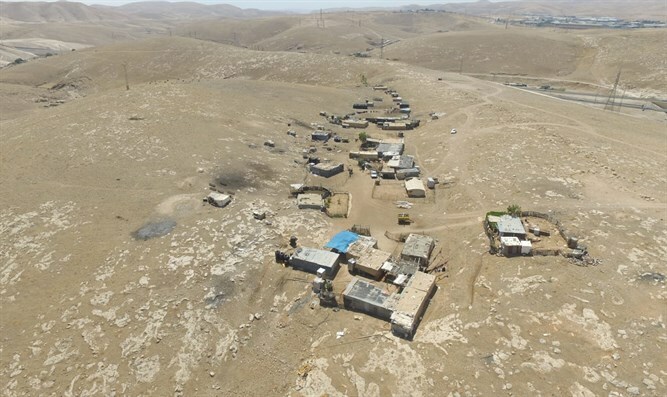 Now, it has become clear that another Bedouin outpost, built with European Union funding only a few hundred feet away from Khan al Ahmar and the subject of two separate Supreme Court petitions, is about to become the newest front in the protracted battle for control of the Adumim region. In 2015, the Regavim organization, which takes legal action against illegal Arab construction on Israel's national lands, petitioned the Ministry of Defense to enforce demolition orders that had been issued for this particular illegal outpost. At the time, the Ministry of Defense announced that the cluster of illegal structures is high on the list of enforcement priorities and would be demolished shortly. The Palestinians petitioned the Supreme Court to freeze the demolition, and Regavim submitted a counter-petition demanding that the Ministry of Defense fulfill its commitment. Last week, the State responded to the Palestinians' petition, informing the Supreme Court that the Ministry of Defense and the residents of the squatters' camp had agreed to negotiations, examining options for legalizing the outpost in its present location, or exploring possible relocation sites if necessary. The residents, who are being represented in the Supreme Court by Palestinian Authority attorneys, have made it clear that they are willing to negotiate only regarding the legalization of the outpost in its present location, and will not consider any offers for relocation. Regavim said it was shocked by the Ministry of Defense's policy reversal, since the outpost in question is located right in the middle of a junction on the path of Route 45, an intercity roadway approved years ago. Legalizing the outpost in its present location, or even allowing protracted negotiations, would mean that the plans for Route 45 will either have to be scrapped altogether or, at the very least, postponed for many years. In the recent press conference convened to announce his resignation as Minister of Defense, Avigdor Liberman criticized Prime Minister Netanyahu's decision to "postpone" the evacuation of Khan al Ahmar; nonetheless, it is now clear that the Ministry of Defense's policy about-face occurred on Liberman's watch. It is also worth remembering that after the plan for massive expansion of the Arab city of Kalkilya became public, the Cabinet announced that the Civil Administration would no longer be permitted to formulate or proceed with building plans in the Palestinian sector without Cabinet approval, particularly in areas of strategic importance, near Israeli communities, or along major thoroughfares. In the case of "Khan al Ahmar 2" – which Liberman himself allowed to proceed – all three conditions stipulated by the Cabinet apply. Yishai Hemo, Regavim's Director of Operation in Judea and Samaria, stressed that "the network of illegal outposts along Highway 1 is not simply haphazard illegal construction to which the State is turning a blind eye; the illegal outpost are, as the Ministry of Defense recently admitted, tools in the Palestinian Authority's calculated, systematic program of land-seizure in strategic locations, aimed at chocking off the growth of Jewish communities and taking control of Area C."
"The fact that the Ministry of Defense under Avigdor Liberman was willing to negotiate the legalization of outposts in this sort of location amounts to Israeli approval for Palestinian control of these areas, " said Hemo. "The State of Israel cannot allow the Palestinians to control Highway 1." The Supreme Court is expected to hear the petitions on "Khan al Ahmar 2" in the coming weeks.